Have you ever hired your children to do chores around the house? Over the years, my boys made most of their money mowing the lawn, and from time to time, I even hired them to try new foods! 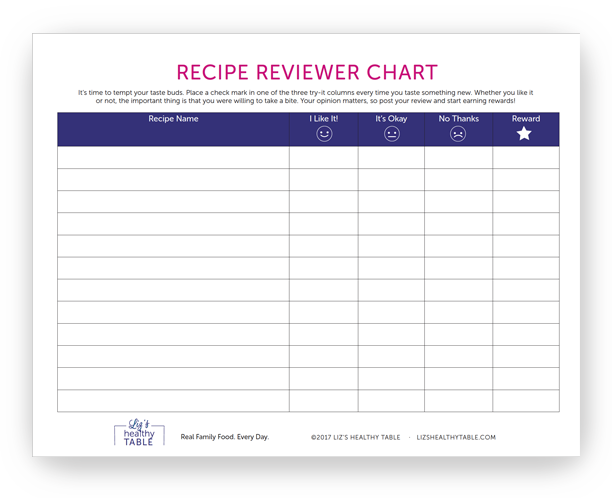 My Recipe Reviewer Chart is a one-page download designed to turn your picky or hesitant eater into a savvy food critic. It works like a charm every time. You’ve been working for an hour making a new and exciting recipe, and you set it down piping hot in front of your kids. One starts digging in straight away…the other one turns his nose up and pushes his plate away. It’s a terrible feeling, and it’s on repeat every night in some homes. The thing is, you know that if your picky eater would just try what you’ve made, she’d probably like it—but you’re not going to force-feed your child. That’s where the Recipe Reviewer Chart comes in! Turn the tables on your picky eaters and “hire” them to taste and critique your recipes. I created a chart to help you get the ball rolling. The chart lets your kid rate each recipe you make, with either “I like it,” “It’s okay,” or a polite “No thanks.” After each review, your child gets a star, and once they’ve collected five (or ten, or whatever you choose) stars, they earn an age-appropriate reward (think anything from stickers or a ball to an iTunes gift card)! Your child will be trying a wider range of foods in no time—with no fights!